Be The Rainbow In Someone’s Day. – this luminous life. Be The Rainbow In Someone’s Day. 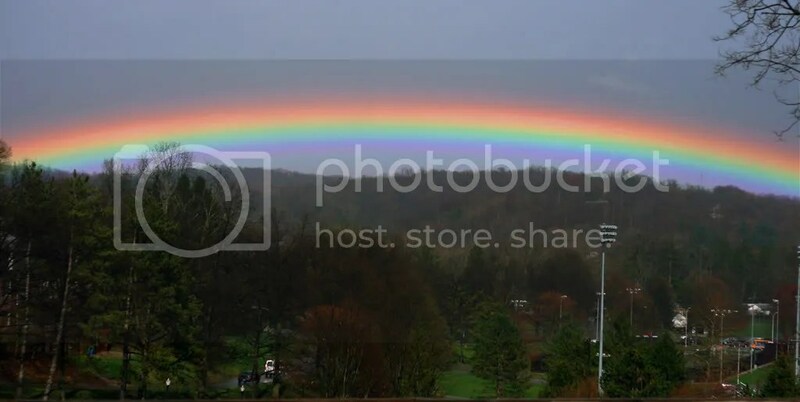 August 31, 2011 ~ Laura N.
Rainbows are remarkable. They are brief moments of joyful beauty in the sky that occur when sunshine and rainclouds meet, leaving a lasting impression. Rainbows don’t just appear in the sky. We are also capable of creating our own rainbows every day through our words and actions. Many people hold onto clouds. We need to bring them the sunshine to create a rainbow of goodness and beauty. One small act of kindness is all you need. I’ve always known the power of a simple action. I understand the effect a kind word can have on someone’s day. Yet, despite this awareness, sometimes I completely underestimate the true power one of these actions can really have. Other people are constantly reminding me of how each little thing I do has a lasting effect. Guess what? Every little thing that you do has a lasting effect on others, too. Most of us don’t even realize how others are impacted by the way we act or things we do. When someone in the car next to you smiles at you, you feel a little happier. When the person yells obscenities at you, your mood goes down. Do you want to be the person that adds a little gloom to someone’s day with unkind words or lack of recognition? Or would you rather be the person that does consistent acts of kindness to bring sunshine into someone’s life? send a random text, e-mail, or message to say hello. open a door for someone. leave encouraging notes (post-its are fun!). give a hug. be random. pay for someone’s meal or cup of coffee. present someone with a flower. dance. in public. someone will see you and smile. show appreciation. say thank you to each person that does something for you today. What can you do today to be a rainbow in someone’s life? ‹ PreviousWhat Is Your Necessary Ending? Next ›Be The Rainbow In Someone’s Day. Excellent advice in order to cheer someone up or simply let someone know that you are thinking of them in a small way. Complimenting someone is a real wonderful idea. I try to pay attention to this every day but the reality is that it happens far less than it should. It sometimes becomes one of those things that I just dont have the time for – I selfishly think that whatever trivial thing I fill time up with is more important than doing something for someone else. Of course in the moment I am not thinking consciously that I don’t have the time for it, but I just don’t make the time for it because i put my energy elsewhere. Thank you for the reminder to be more intentional with my actions for others. I try and think about this everyday as I move through my days, even the long ones. I find the hardest people to do this on, are the ones that mean the most to you. After a long day, I don’t want to be the rainbow but I am learning how important it really is. Thanks for sharing. This is beautiful!